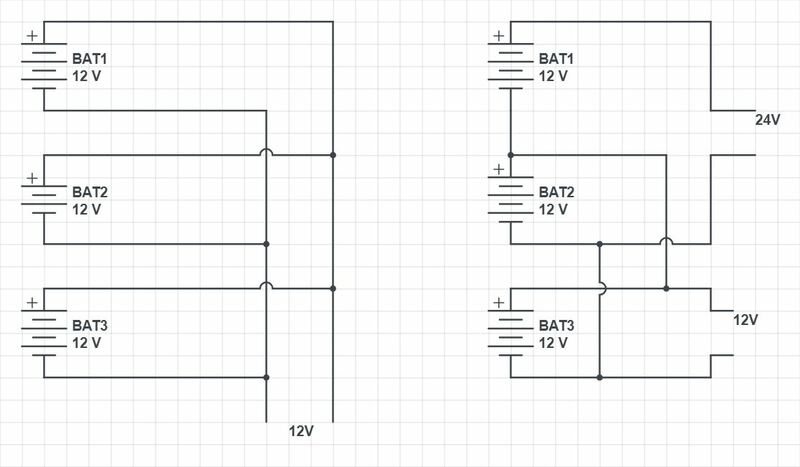 I'm looking to combine the 2 circuits shown in the picture below using a switch. (ON-OFF-ON) I would like to keep the 12V output seperate from the 24V output. This is to maximize efficiency when using 12V with the added possibility of using 24V and 12V at the same time. Switching 2 batteries from series to parallel with one output using a DPDT switch seems logical to me, but combining 3 batteries in the desired way is a bit overwhelming because in my attempts there's always a short. edit: my problem: I have 3 battery mounts on a camera system with interchangeable batteries (sometimes I only use 2 batteries, sometimes 3 because weight distribution is important, all are charged seperately). I need a 12V out all the time and sometimes 24V. I would like to discharge all batteries as evenly as possible. Here's how to do it (but it's still a bad idea). Figure 1. 12 - 24 V switching. As others have pointed out this is not a good engineering solution to whatever problem you are trying to solve. In 12 V mode all batteries will discharge at the same rate. Since they're 12 V I'll assume that they're lead-acid and so you'll be recharging them too. This is fine in parallel mode. In 24 V mode BAT1 will discharge at a current I but BAT2 and BAT3 will discharge at I/2 so they will be unevenly discharged and this will cause problems when switched back in parallel as their voltages will be different and high currents may flow. Not the answer you're looking for? Browse other questions tagged batteries switches dc parallel series or ask your own question. Does mixing and matching battery capacities result in a bottleneck when wired in series?